The L at City Vista is one of multiple upscale condo buildings in Washington, DC’s City Vista Complex. The complex also includes the K and the M condo buildings, as well as the Gables apartments. The complex is an integral part of an ongoing modern development movement in the Mount Vernon Triangle neighborhood. 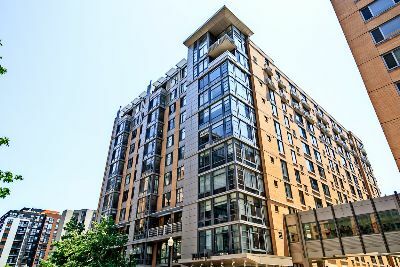 With 149 residences, the L at City Vista was delivered in 2007, and offers a host of onsite amenities, as well as an amazing downtown location—two blocks from the famed Mount Vernon Square, and less than 10 blocks from the White House. This contemporary brick, concrete and glass tower stands 11 stories, and is also home to ground floor retail-including a Safeway Market! You don’t even have to leave your building for groceries! Located at 440 L Street NW, the L is in DC’s 20001 zip code, and considered part of Capitol Hill as well as the Mount Vernon Triangle. It is also next-door to Chinatown. Entering from the street level, residents enjoy a luxury foyer with twenty-four hour front desk and concierge. Condos for sale come in a wide variety of floor plans, with spacious one and two-bedroom units ranging from 628 to 1450 square feet. Some units also include dens. Inside these attractive city homes, you’ll find hardwood floors, soaring ceilings and floor to ceiling windows. There are glass doors to the balconies, luxury bathrooms and gourmet kitchens with granite counters, breakfast bars and stainless steel appliances. All units also come with washers and dryers. As for common amenities, residents enjoy dry cleaning pick-up and delivery, a fitness center, a library, and a community room with catering. Plus, life at the L also includes direct access to the K’s heated rooftop pool with terrace, grills and lounge. And, don’t forget the ground floor Safeway plus other retail. Garage parking conveys with some but not all units. And then there’s the neighborhood itself—easy walking distance to the Mount Vernon Square Metro Station, as well as the Verizon Center with concerts and Washington Wizards NBA basketball. You’’ also find an amazing array of bars, restaurants, shops, theaters and museums.